Baccarat glassworks (French, founded 1764), Paperweight, 1847. Milwaukee Art Museum, Gift of Helene E. Tash, M1996.68. Photo by the author. This blog is about museum life “Under the Wings,” right? One of the most important and perhaps most buried “under the wings” duties of the curatorial department is the care of the art collection (housing, safe transport, conservation) including the proper organization of what we have, where it is, who made it, how much it is worth, etc. As the Museum acquires new objects, we make a new TMS (our database, The Museum System) record that tracks everything from insurance values to the artist’s nationality and birth date. As time progresses, TMS becomes rich with information, but that is entirely dependent on constantly adding new data. A small thorn in our side was an old record saying “188 glass paperweights” and the location of four high-density storage boxes. And, that’s all it said. Were these 19th-century French millefiori paperweights? Folk art advertising paperweights? Tourist paperweights from 1950s Venice? We didn’t know. Enter our Milwaukee paperweight expert. 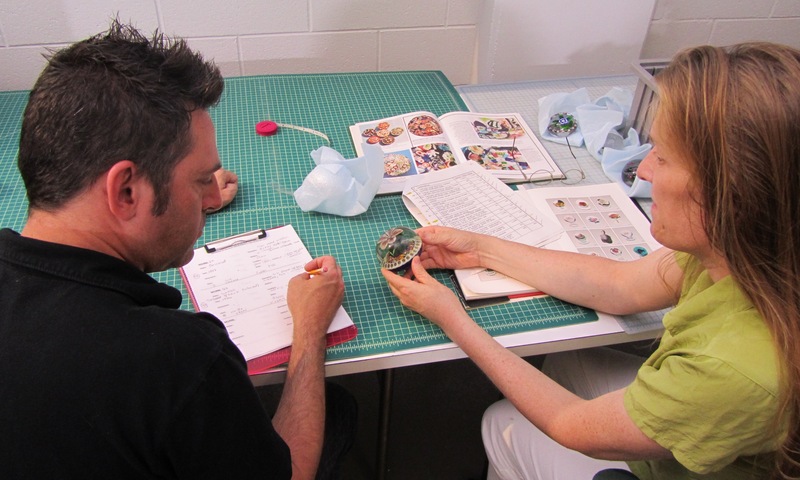 Museum curator William Rudolph and Lynn Harper together examine a Scottish 1930s paperweight by Salvador Ysart. Photo by the author. Clichy Glasshouse (French, 1837-1885), Paperweight, ca. 1850. Milwaukee Art Museum, Gift of Helene E. Tash, M1996.121. Photo by the author. William Rudolph, the Museum’s Curator of American Art and Decorative Arts, and I came to know Lynn Harper. Ms. Harper is by day the City of Milwaukee’s lead drawbridge operator, overseeing the raising of the many bridges spanning the Milwaukee, Menomonee, and Kinnickinnic Rivers. In her off hours, she travels the country and scrolls eBay, collecting glass paperweights and Oriental rugs. With the offer of a free lunch and the opportunity to discover a box of mystery paperweights, she was generous enough to give the Museum a hand cataloging our collection of 188 ‘weights. 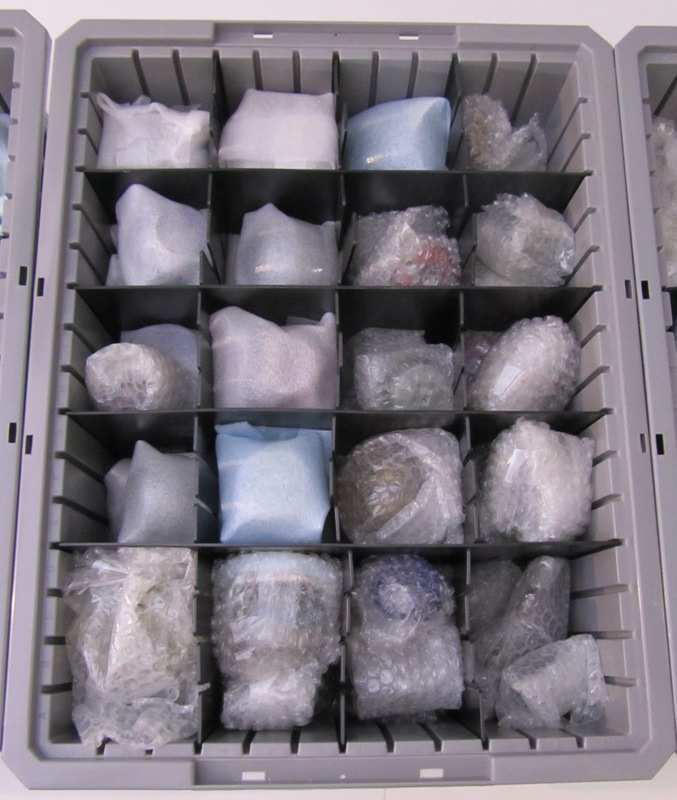 Box of packed paperweights in Museum storage. Photo by the author. Together, William, Lynn, and I examined each of the ‘weights. William acted as scribe for Lynn as she looked closely at each one, thumbed through her many reference books, and helped us to identify a specific maker and date for each of the colorful glass works of art. She taught us how to identify small bits in the glass work that identified a maker—like the unique pink, white, and green rose called the “Clichy rose.” Sometimes the glass carried an exact signature. For instance, look closely at the photograph of the Baccarat paperweight at the top of this post. In the lower right corner of the weight, you see white glass canes with tiny blue letters saying “1847,” and above that, a white cane with a microscopic red glass “B.” This means Baccarat, made in 1847. As we carefully but quickly moved through the 188 weights, I was in charge of recording the measurements and taking a photograph of each paperweight. 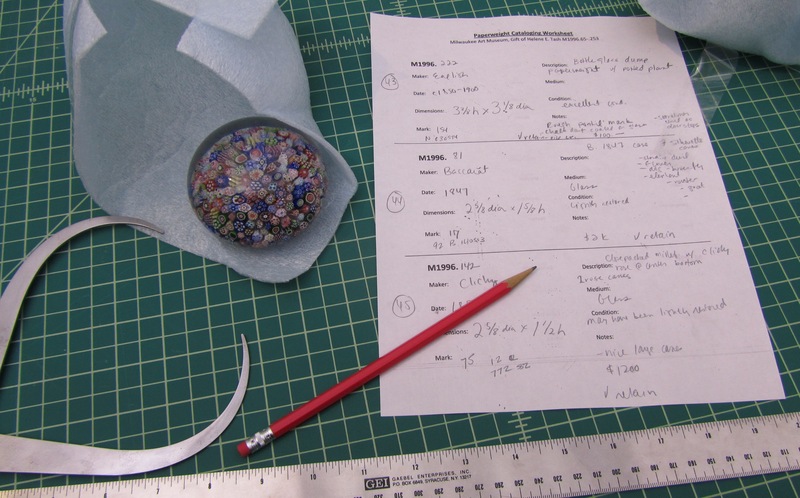 The picture below shows the calipers I used to measure the diameter of each glass orb. 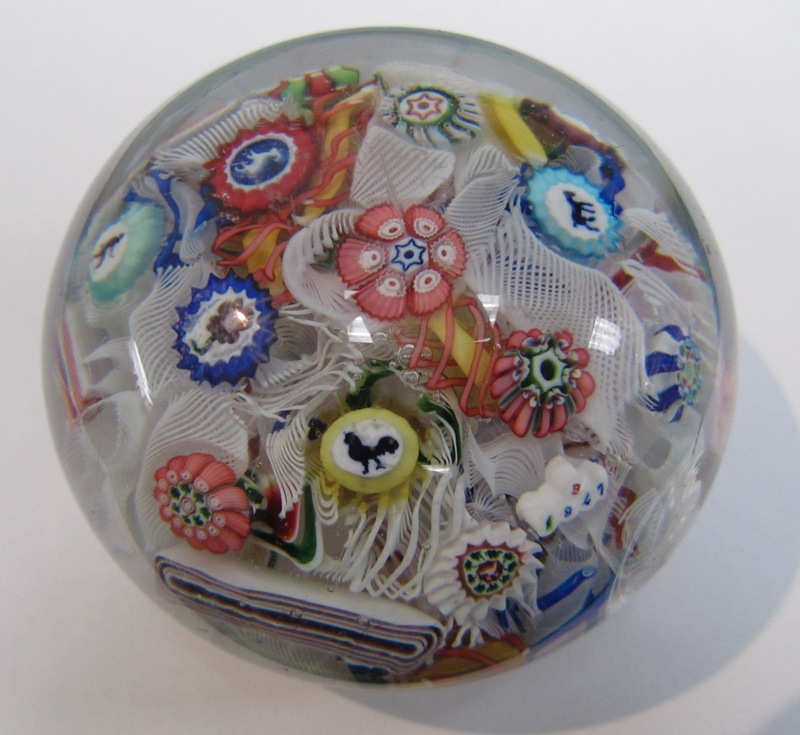 We discovered that we have some wonderful examples of paperweight art in the Milwaukee Art Museum’s collection. Our region is also home to one of the world’s greatest paperweight collections. Down the road in Chicago, you’ll find over 1,400 paperweights in the Art Institute of Chicago’s famous Arthur Rubloff Collection, which documents all periods, designs, and techniques in paperweight glass. Many of their ‘weights are on view in their museum’s lower level. Now that we’ve recorded all the information for the 188 ‘weights on the paper cataloging sheets (see below), the next step is the tedious task of entering all of the information into the database. I’ll be hard pressed to make a fun blog post about that. Tools used for cataloging paperweights. Photo by the author. This entry was posted in Art, Behind the Scenes, Curatorial and tagged 19th Century Art, Baccarat, Behind the Scenes, cataloging, Clichy, Collection, From Museum Storage, From the Collection, glass, paperweights. Bookmark the permalink. Lynn was so kind to share this information with me. My father, Johne Parsley, was the oldest lampworker of fine botanical paperweights. He died in 2009, but his work is celebrated around the world in museums and top private collections. I live here in Milwaukee and, in fact, have his complete studio in storage. I also have an outstanding collection of contemporary weights and closely know many of the makers here and abroad. I have wanted to mount another paperweight exhibit in Milwaukee — there was one at the Villa Terrace some years ago. I do hope you will consider me as a local resource in this sublime genre of work. By the way, your collection was brought to my attention a few years ago in a meeting with your Education Department. We are so thrilled to connect all the Milwaukee paperweight literati to the Museum’s collection! We look forward to staying in touch as future plans for this collection develop. The Delaware Valley PCA chapter referred to this site in a Facebook post, for which I thank them. 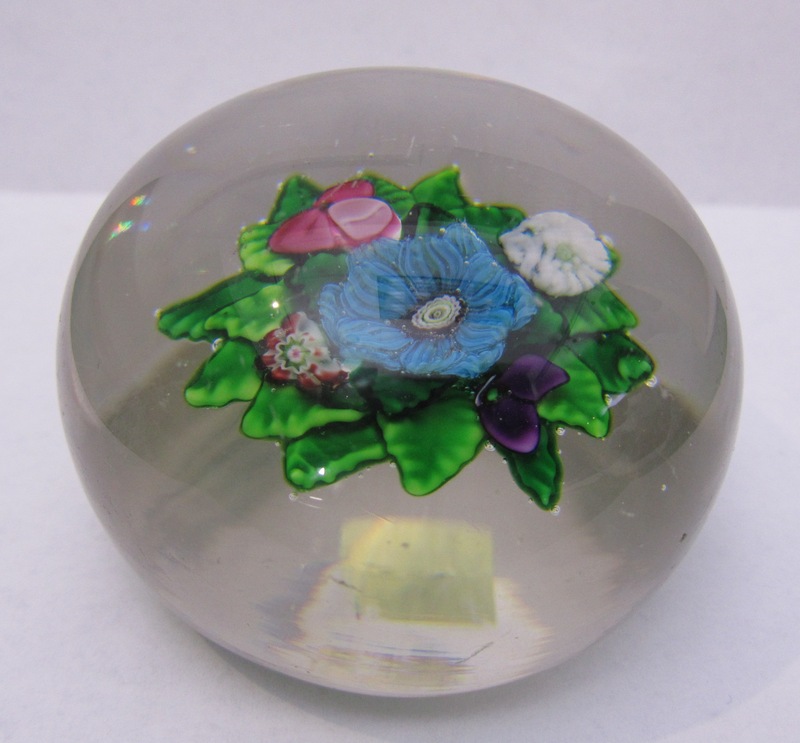 i am a collector of paperweights, with about 200, from museum quality to dime store variety. I currently volunteer at a local art museum where I am updating the catalog of their collection of about 200 weights, all before the mid-’60s. I’m trying to identify some unknowns, I’m photographing the whole collection, and I’m trying to provide consistent descriptions of the weights, using Paul Dunlop’s “The Dictionary of Glass Paperweights” as a guide. Of course, your report is of considerable interest to me. Perhaps we could compare notes? There is a wonderful paperweight resource for you here in the state of Wisconsin, Bergstrom-Mahler Museum in Neenah. I am surprised you are not aware of it. The museum has is world renowned for its paperweights and has the most representative collection in the world. I think they have more than 2,000 antique and contemporary weights. It’s like Nirvana for collectors.